North Dakota State has been tabbed as the Missouri Valley Football Conference pre-season favorite in a poll conducted by league coaches, media and sports information directors. NDSU has been picked first in the pre-season poll for seven-straight seasons. North Dakota State has earned the league title for seven-straight years, four times sharing it with another league school. This year, NDSU was a unanimous choice, receiving all 39 first-place tallies and a total of 390 points. It marks just the second time in league history that a team received all of the first-place votes in the MVFC pre-season poll (NDSU also did it in 2013.) South Dakota State earned the second spot in the poll, finishing with 340 total points, followed by UNI (270), Youngstown State (258), Illinois State (248) and South Dakota (206). The league is coming off a season in which five teams represented the conference in the playoffs. The MVFC has had four or more playoff teams in four-straight seasons (earning five each in 2014, 2015 and last year). Western Illinois was one of the league's five playoff teams a year ago, and the Leathernecks -- with new head coach Jared Elliott at the helm -- are picked seventh with 163 total points. Western is followed by Southern Illinois (139), Missouri State (90) and Indiana State (41) in the voting. A pre-season favorite has claimed the league crown 20 times (in 32 previous polls). North Dakota State was picked to win the league last season, and the Bison earned both the league title and the national title (following a 17-13 win over previously unbeaten James Madison in the NCAA Division I Football Championship game in Frisco, Texas). Valley Football is celebrating its 34th season in 2018. In its first 33 seasons the league owns eight national crowns. MVFC teams combined for an 8-4 record in last year's playoffs, while North Dakota State and South Dakota State both reached the semifinals. That marks the third time in the past four years in which two league teams played in the semis. North Dakota State, meanwhile, represented the league in the title game, marking the 7th-straight year at least one MVFC team has reached the championship game -- an FCS record. Notably, MVFC teams have combined for a 52-23 record in the playoffs this decade. Only one other league has as many as 20 wins since 2010 (CAA Football is next best with 37.) The 2018 season begins Thursday, Aug. 30, with four league teams in action. Nine non-conference games feature road matchups against FBS opponents. An MVFC school has recorded a win against an FBS school in each of the past eight seasons, setting a league record in 2016 with four that year. Conference play begins Thursday, Sept. 27, as Indiana State hosts UNI in the first league tilt of the season. 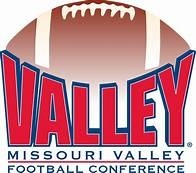 The MVFC will announce its pre-season all-conference teams this week (Tuesday-Offense; Wednesday-Defense). North Dakota State tops the league with 11 total selections, including a league-best eight on the first-team unit. South Dakota State, meanwhile, has the second-most selections, with eight total honorees. Youngstown State has five first-team selections, meanwhile, which is second-best to NDSU.